Every year, we celebrate the freedom we have in this great nation on July 4. Across South Carolina, from Myrtle Beach to Charleston, you’ll find locals and tourists alike celebrating in style. Whether you’re attending a firework show, a fruit festival, or 5K, the Palmetto State does Independence Day right. 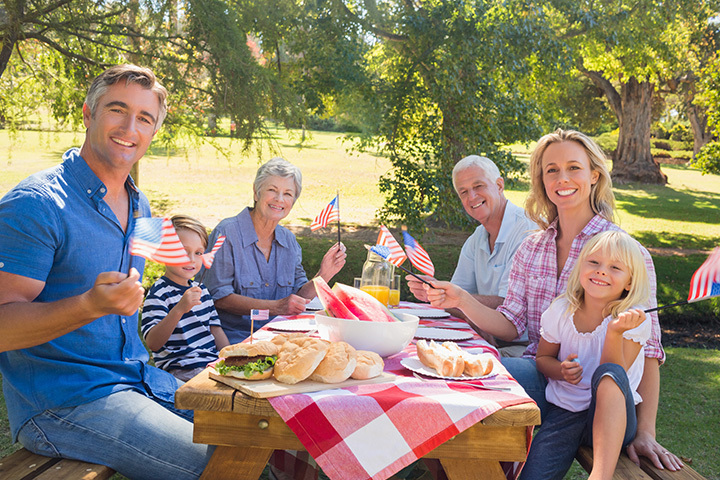 Now deck yourself out in red, white, and blue, and celebrate the perfect Fourth of July in South Carolina! Fireworks are a regular occurrence at Broadway at the Beach, but that doesn’t make them any less spectacular. In addition to the rocket’s red glare over the 23-acre complex, you can marvel at their entertainment lineup, everything from fire dancers to stiltwalkers to costume characters. While you’re there, you can grab dinner at Broadway Louie’s, sip a daiquiri at Wet Willie’s, or dance the night away at Malibu's Surf Bar in celebration of your independence. Hosted by Magic 98.9, ESPN Upstate, and many more, visitors can eat their fill of Philly cheesesteaks, hot dogs, barbecue, funnel cakes, and other tasty food truck offerings. Local businesses like Ciclops Cyderi & Brewery and Monsoon Noodle House are within walking distance for those who prefer an indoor dining experience. Guests can settle down and listen to live music, or stroll the grounds to look at exhibits from local vendors. A grand fireworks finale will cap off the evening. Who says all the Fourth of July fun has to happen after dark? The Lexington County Peach Festival provides family fun all day long. From peach recipe contests to live music to an antique car show to the Peach Parade, you’ll have plenty to keep you busy while you wait for the sun to set. The event takes place across multiple venues, including the Gilbert Community Park. You can end your day by finding a spot at the field behind Gilbert Primary School to watch this fantastic firework display. As the oldest and largest running race in Beaufort County, more than 1,700 runners participate in this event each year. The race consists of Hilton Head Firecracker 5K Run, Family Fun Walk, and a Children’s Fun Run. To celebrate your win (or loss), participants can head to the Post Race Patio Party at New York City Pizza for drinks and food specials. There’s no better way to celebrate our country’s freedom than by engaging in a fireworks display surrounding one of the most historical pinnacles of South Carolina heritage. Fireworks blast from the deck of the USS Yorktown parked in the harbor, set to the tune and beat of patriotic music. Prior to the show, visitors can tour the USS Yorktown and listen to brave tales of U.S. veterans. Greenville’s most popular fireworks show returns this year to provide a free event honoring our country’s independence. A Military Hero award will be issued at the Peace Center Amphitheater Stage. Visitors can stroll along downtown Greenville before the show begins, taking advantage of the multitude of restaurants, ice cream palaces, candy stores, and bars that line the streets, as well as enjoy live music on two stages and a kid zone. Local restaurants and food trucks like will have street-side setup for convenience. This free family-friendly event is one that locals look forward to every year. When the gates open at 4 p.m. on July 4, visitors can enjoy inflatables for the kids, along with a variety of live bands that play until the sun goes down. A massive fireworks show ends the event. Independence Day may fall on July 4, but some areas, like Rock Hill, just can’t wait to celebrate. Their free Red, White and Boom festival begins Monday, July 3, and consists of a variety of live music, inflatables, food trucks, and ice cream eating contest. The event culminates with a glorious firework display at 10 p.m. The Town of Cheraw sponsors a free annual Fourth of July celebration each year. Held this year on Monday, July 3, visitors are encouraged to participant in the Decorate Your Bike or Wagon contest for a chance to win a prize. Kids of all ages can enjoy rides and games, as well as the Children’s Parade that kicks off the event. When the sun sets, you can settle on the green to watch a spectacular array of fireworks to end your evening. Saturday, July 1, visitors can start getting into the spirit of Independence Day with a boat parade on Lake Murray beginning at noon. Guests can enjoy swimming or fishing in the lake while waiting for the sun to sleep. To end the celebration, fireworks will launch from two sites, Dreher Island and Spence Island. The event itself is free, however you will need to pay the normal park admission fee if you choose to view the show from these locales. You can also pick a spot along the Lake Murray Dam, or park your boat in the water in view of Dreher or Spence Islands. View more South Carolina July 4th Fireworks and Celebrations.